Sometime in the dark and misty days of Georgetown pre-the Georgetown Metropolitan (i.e. last July), DDOT issued a report of its study on transportation issues in Georgetown. GM followed the study and report closely and wants to take this opportunity to discuss some of the study’s short term and long term recommendations. The study focused on all aspects of transportation: private car, transit, biking, and pedestrians. While GM agrees with some that DDOT is unduly focused on a concept of “level of service” (i.e. judging an intersection solely by measuring how long it takes to get through it) he believes the report generally balances well the interests of drivers, bikers, and walkers. One thing the study specifically didn’t focus on is parking. GM believes that parking and transportation are too interdependent not to consider together, but he suspects if the study group tried to consider the bete noir of parking shortages, it would have taken away too much time and attention from the other issues. GM is particularly excited about the traffic calming measures on R St. It is a major bypass for speeding cars trying to get around Georgetown. With Montrose Park and its visibility-restricting hedges right there, it’s just a matter of time before someone gets hurt or killed on that stretch. The study considered what to do about the G2 going down narrow O and P streets. After nixing the idea of rerouting the line, DDOT concluded that the best answer is to switch from a 40 ft to a 30 ft bus. The problem is that the report acknowledges that this change will do nothing to prevent the bus from blocking traffic. The report concludes that despite the fact that the shorter bus will be overburdened at peak-use times, the shorter bus will “provide for fewer vibrations”. In other sections of the report the study addresses other “vibration” trouble spots and recommends resurfacing the street to dampen the rattling. Speaking of buses, the report recommends the installation of bus lanes on M and Wisconsin for peak hours. GM would love to see this but is doubtful entitled drivers won’t deep six the plan. Besides, DC has yet to come up with a bus lane model that actually keeps cars out of the bus lane. The study considered whether it could make a recommendation on the trolley track and cobblestone situation on O and P st. It concluded that there are other studies going on addressing this situation and that it would leave any decision up to them. Allow a left turn from eastbound M St. to northbound Wisconsin. This is as much about getting cars off the side streets as it is reducing traffic. By allowing cars to turn left here, they will be less likely to turn left at 33rd or 31st. Do the Barnes Dance. A Barnes Dance is when an intersection stops all car traffic to allow pedestrians to cross. The advantage to this is that there will be less crowding on the already tight corners since nobody will cross over into a crowd of people waiting to cross another way. Also, it allows pedestrians to cross diagonally (i.e. from PNC Bank to Bananna Republic). Finally, it would significantly increase traffic flow and pedestrian safety because there would be no more cars trying to turn right through crossing pedestrians. The study considered whether to take a foot away from each outside lane of M St. and widen the way-to-narrow sidewalks. Sadly they concluded that it would be too costly. Additionally, the study considered at multiple spots the introduction of bus bulb-outs, but did not include any of them in its final recommendations. The study recommended turning 30th and 31st into one-way roads, with 31st going northbound and 30th going southbound. Initially they had recommended the opposite, which would have made no sense at all (to get from Q to R west of 30th would require you to go all the way to Wisconsin Ave.). But even with a more sensible routing, it still is a bad idea in GM’s opinion. Ostensibly this change is aimed at discouraging drivers from cutting through the side streets, but that doesn’t make much sense. Drivers that are cutting through the side streets tend to stay on R all the way from Wisconsin to 27th, or they take Q all the way through Georgetown. They don’t take the north-south streets. And there are plenty of reasons not to turn 30th and 31st into one-way roads. First of all, it’s a pain in the neck for residents on that street to always approach their house from the same direction regardless of where they’re coming from. Secondly (and more importantly) one-way roads make people go faster. 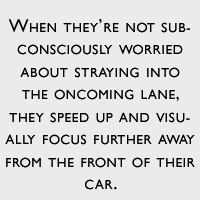 When people are not subconsciously worried about straying into the oncoming lane, they speed up and visually focus further away from the front of their car. This creates a dangerous situation. 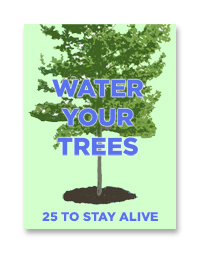 Sure, we may lose fewer rear view mirrors, but that might come at the cost of life or limb. Those are some of the bigger items that jumped out at GM. Take a look for yourself to see whether your block will be affected. GM’s not sure how likely it is that these recommendations will ever come to fruition, although some of the short term ones (like the installation of crosswalk timers) already have. Great write-up. I’ve always worried about the M Street, Wisconsin intersection. Perhaps the pedestrian shuffle will handle this. Such a system may also reduce the number of jay walkers.